Amersham Chromatography Skid Bioprocess System Pharmaceutical GE AKTA . New Life Scientific, Inc. 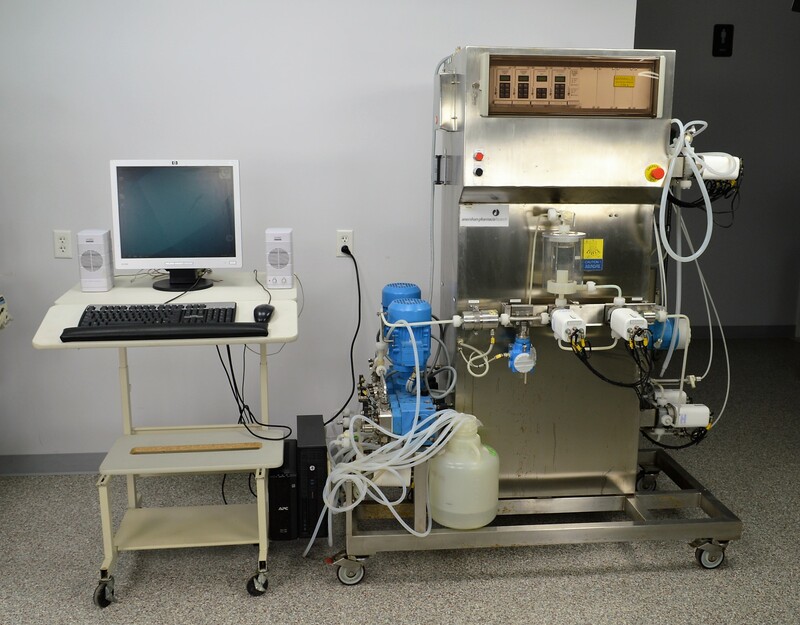 This Amersham Biosciences bioprocessing system is in good condition with noticeable corrosion and staining that was sustained in a working environment. There are a number of valves, pumps, and gauges that are in great condition although this system was produced in 1999. New Life Scientific technicians evaluated the instrument for mechanical integrity and the software on the included computer. The control cabinet lights up when powered, indicating the boards and hardware are receiving power, however there are software components that the end-user will need to address before using this system. The controlling software installed on the PC was corrupted before the technicians could finish the testing the instrument. The Unicorn software (system) noted there was an error when the valves required adjustment and tested was halted; the technician restarted the system to continue testing. The Unicorn software would not re-open and the original software disk was not included for the PC. The technician re-installed older versions (3.10 & 4.30) that were available in the tech shop; unfortunately, the network card (CU-950) in the control panel skid is only compatible with Unicorn version(s) 5.31 and higher. Likewise, the lesser version 4.30 requires another PCI card (CU-900) or the Unicorn control board and 3.10 requires a specific ISA card inserted in the ISA card slot. As a result of incompatibility between the software and card, the skid and PC would not connect or recognize the software version. Because this instrument powers on and showed all signs that suggested functionality, this instrument will be sold as a used-untested system that requires controlling and analysis software. Although the system could not be confirmed fully-functional, Unicorn 5.3 software is available from GE. New Life Scientific technicians reached out to the local GE/AKTA representative that provided us with the retail price of 1732.00 USD, plus 50.00 USD in shipping and handling. The end-user may be able to request a discount from their local GE representative. New Life Scientific technicians are confident that the software is the only hindrance that this system has from being fully-functional. To protect the buyer, NLS will offer a ninety-day warranty on this product so that the user can evaluate, test, and be completely satisfied with the purchase or return it within that time frame. Please contact New Life Scientific for warranty details and inquire prior to purchase.